Running a convention every six months since 2015 has been a blast, and we’re not finished, but we need to take a short break over Summer 2019. In this post, we’ll talk about our reasons, our vision for Winter 2019, and our commitment to low-cost, high-value events. Anybody who’s read this blog (or spoken to me in 2018) knows I’m tired. I love Ettin Con and am determined to keep it alive, but we have some things to address before it can continue. Before I dive into the detail, please know that if you’re one of our monthly patrons, we’re committed to giving you the rewards you expect. If you want/need to pause your pledge, we totally understand. If you would prefer a refund to Summer rewards, we‘re happy to do that. If you’re not interested in the details, but want to stay in touch, please take a moment to sign up for our email newsletter, so we can keep you posted on developments towards our Winter 2019 event. On with the post! Firstly, we’re a skeleton crew. Each station at our event has fewer staff than it requires, and I had to put myself on every shift in Winter 2018 to run the event at all. Someone wasn’t able to make it to their shift, or even warn us, which led to me (poorly) covering two shifts at once. This isn’t the level of support we want for our attendees. Deferring the event until Winter 2019 gives us much more time to recruit committed staff across all stations, and room for surprises. Moreover, with a small number of hands, the planning stages of each event have been increasingly difficult to bring together as sponsors change, or demonstrators aren’t available for our chosen date. Finding alternate people to run things like the Magic tourney (absent from Winter 2018) or following up on promised support for the raffle (also absent from Winter 2018) became impossible amid, well, everyday life and work. We’ve always been ambitious and for the first few years, we managed to make almost everything happen, but that quality is clearly starting to slip, and we want to do better for you. Hanging over our heads for some time has been the oft-requested dream of running a weekend-long event. We’ve been deferring this for years, because there simply hasn’t been enough time to organise it — but we see 2019 as our opportunity to make that time. Skipping the Summer 2019 event means we can carefully choose a weekend for Winter, book the venue well in advance, recruit enough staff and THEN start accepting bookings as we bring all the other pieces together. More of our planning tasks need to be assigned across our volunteer base. New sponsors and collaborators need to be found, consulted and secured. Extra raffle prizes need to be procured. More carefully planned & tested network management tools need to be implemented to stop rogue devices from using up all our data quota before the doors open. All the things we normally do need doing again, but bigger and better for attendees, as well as slower and easier for volunteers. With all of this in mind, we’re starting our biggest volunteer drive over the coming month, with a two-day event in our sights. As soon as we have the dates/venue locked in, we will be offering plenty of detail on what we need help with, when, where, and for how long, as well as how we plan to compensate volunteers for their time. Our strategy has always been to offer the most value to attendees for the lowest possible cost, and our volunteers have enjoyed a ratio of double the fun to the amount of work — both aspects we’re quite keen on maintaining. Also, to make the most of our growing games library, starting in November 2018 (if not sooner), we’ll be making best efforts to bring some or all of the library to the Katoomba Library board game events on the first Saturday of each month, run by Afternoonified. 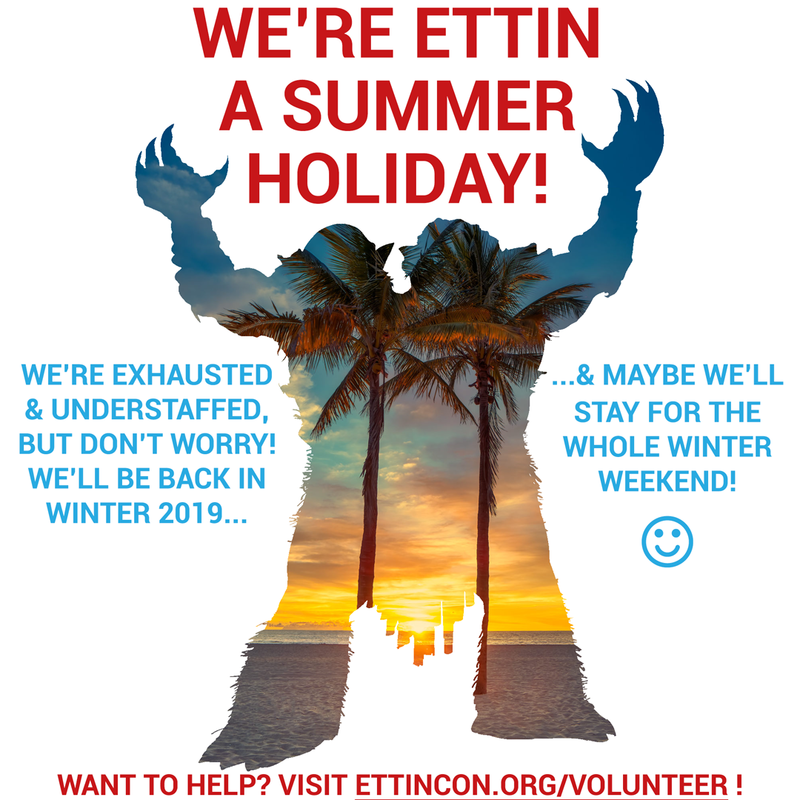 If you have any ideas for our two-day event in Winter 2019, or would like to volunteer to help plan and/or run the event, please get in touch via EttinCon.org/volunteer. Thanks! PS: Matt did his back in, & has mysterious bursitis, and is really busy at home with baby & building, too.